October is a distant memory already and I’m a bit late posting this month thanks to a full on work trip to Preston over the last couple of days with very little time for getting on line. College started again at the end of September, but really ramped up again last month with lecture weekends, starting on the first assignment of the year and seeing my first real life client! Work has been no less busy than usual, and I’ve got some interesting projects going on at the moment. It was another month where it felt like I wasn’t really home at the weekends although I’m sure I was! We’ve been in the house 6 months now, but it feels like less than that in some ways because I’ve barely been there! 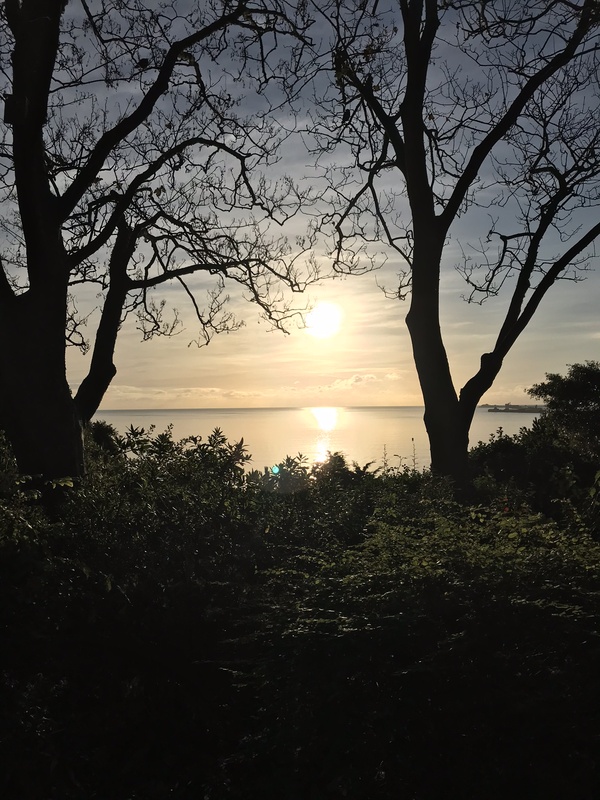 We had a lovely weekend in Dorset at the end of the month (where I took this picture of the sunrise), with some nice walks by the sea and a chance to catch up with Mum and Dad. Complete my first client consultation and achieve satisfactory on as many competencies as possible. – Done. I was pretty nervous about going into the clinic for the first time. With anything like this, the more you learn, the less you realise you know! However, my client was lovely and I’m hoping when we meet again this month she’ll have seen some benefits as a result of my recommendations. Of the 15 competencies, I managed 12 satisfactory, 2 developing and one wasn’t rated as I didn’t cover that specific aspect with my client. I need to get 4 satisfactory ratings on each competency over the next 8 meeting with clients, so that’s a good start. Make good headway on my assignment, at least 50% written by the end of the month – not quite there, although I have made a good start and have gathered a lot of research that will help with the rest of the writing. Keep up the exercise and adjust my programme as necessary after the injections. The injections seem to have gone ok and pain has definitely subsided in my hamstring tendon. Further down the hamstring is still a bit sore from time to time, but I’m not sure if that’s related or not. I have been back to some running which has been lovely (no, really!) and I’m seeing the consultant again soon, so will be good to get his opinion on my progress/prognosis. Go through at least one wardrobe – er, not yet. Draw up a shortlist of builders and have some initial conversations – not really got this far, although we have got some builder recommendations from our architect that we’ve started looking at. He’s working on the detailed structural drawings so that we can go out to tender, so we’ve started looking at kitchens and are trying to think about all the detailed things like where we’ll replace carpets and what colour light switches we’d like, decisions, decisions! November is the calm before the Christmas storm (calm being a relative term when it comes to my life of course…). It starts and ends with work trips (Preston this week, Sweden at the end of the month). In between I’ve got a follow up consultation with my client in the training clinic, an assignment to complete and another weekend of lectures. Other than that though, there are a couple of weekends without too much going on, so hopefully there will be an opportunity to chill a bit (manic laugh). I’ve got a lot to get done in November (as ever! ), so I’m keeping my goals as the basics I need to do to keep things ticking over rather than move things forward much.